Process you tabbing, labeling, stamp, Post-It-Note or decal affixing with the Ameritek Jet1 Tabber. This unit may be the easiest floor model tabber to set up and operate! In-line or off-line this high volume tabber is built for today’s mailing professionals. Its durable design will insures years of reliable operation. The new USPS requirements for tabbing booklets require two 1-1/2″ tabs wrapped on the leading edge of the mail piece and one 1-1/2″ tab wrapped on the trailing edge of the product. By putting two independent tabbers inline we can meet this requirement in 1 pass! This configuration is shown below. Add in a Walco Bump Turn system and you can tab both sides then turn it to go directly into your addressing system. The Ameritek T2000 design has been updated for improved operation in tabbing booklets to accommodate the new tabbing regulations. Tighter registration wheel assembly spacing for improved product control, ensuring rollers are in constant contact with the mailer. Modified base output and input sections to allow close spacing of bases. The tabbing system can easily be broken up into two fully functional independent tabbers with the removal of two integration brackets and cables. Single Tab Up to 30,000 pieces/hr. Double Tab Up to 24,000 pieces/hr. Triple Tab Up to 18,000 pieces/hr. 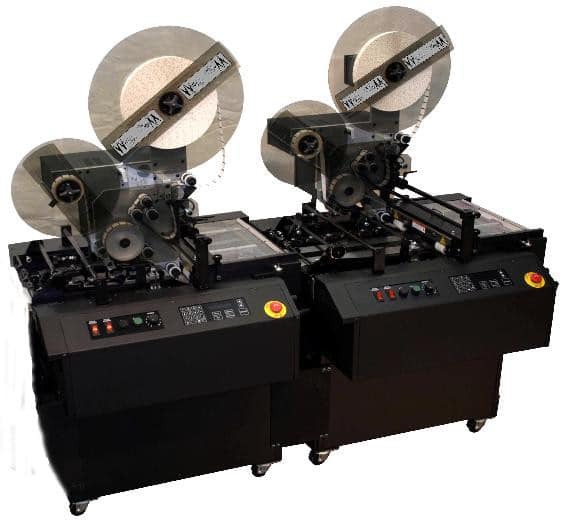 Types Tabs (single, double, triple), wafer seals, labels, stamps, repositionable notes, customized stickers, scratch-offs, machine grade paper and adhesive, clear, translucent, unperforated, vertical perforated. Note Clear and translucent tabs require an “engineered backer” with registration marks for indexing. Roll Size Up to 19.5” diameter mounted on a 3”core, up to 50,000 3/4” tabs or 40,000 1” tabs. OPTIONS: Available in standard or wide head configuration. Complies with USPS specifications for tab placement and application. Specifications subject to change without notice. Speeds may vary depending on material and application.